1:64th Scale, ERTL, CASE IH, Authentics #7, Magnum 7250 Tractor with Duals! VERY HIGH DETAILED! This auction is for a new 1:64 1/64 scale diecast ERTL 1991 John Deere 4960 Tractor . nice little model would make an excellent addition to any collection or toy box. Please check my other listing for lots of Farm toys and replica models. 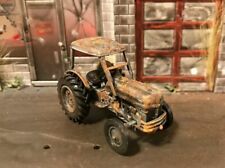 1:64th Scale, SpecCast Oliver Model 1750 Wide Front Tractor with Loader! Beautifully done details! Fully functional Loader, 3pt Hitch, Shift levers & so much more! Model 7290R Tractor with Duals. 1:64 ERTL John Deere. 1:64th Scale, SpecCast Oliver Model 1800 Narrow Front Tractor with Checkerboard Grille. Beautifully done details! 3pt Hitch, Shift levers & so much more! Nice little model would make an excellent addition to any collection or toy box. You are buying a1/64 Ertl John Deere 9620R 4WD Tractor w/ Triples & 2510 Nutrient Applicator Set. Made of Resin. Lots of Great Details including chains for hooking to tractors/trucks! ERTL 1:64 JOHN DEERE Model 9570RX *TRACKED TRACTOR* NEW!! Red 1983 International Harvester Model 3488 Open Station Tractor. 2018 GreenLight Collectibles. DOWN ON THE FARM SERIES #1 . 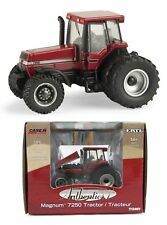 This auction is for a new 1:64 1/64 scale diecast Case IH International Harvester 5488 4WD Tractor w/ duals. would make an excellent addition to any collection or toy box. Please check my other listing for lots of Farm toys and replica models. WARNING: NOTE THAT ALL TOYS HAVE SMALL PARTS AND POSE A CHOKING HAZARD. BEIGE ENGINE. You are buying a1/64 Ertl John Deere Double Anhydrous Ammonia Tank Trailer. The item is very detailed and very sharp looking. 1982 International Harvester 3488 Tractor w/Duals. 2019 GreenLight Collectibles. DOWN ON THE FARM SERIES #2 . VERY SHARP LOOKING! RUBBER TIRES. Yo u are buying a 1/64 Ertl Custom MacDon 40 Ft. Draper Head - Green. This header is i n excellent condition. The pictures are of the actual item. This item is very sharp looking. ERTL 1727 Massey Ferguson 4880 4 Wheel Drive Tractor 1:64 MIB Early 80s Nice! Mint in a nice box. The blister bubble has pulled loose from the box but the tractor is still mint. Circa early 1980s, made in Singapore. If there is a problem, we will take care of it! 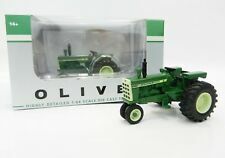 This auction is for a new 1:64 1/64 scale diecast John Deere 8430 4WD Tractor w/ duals. would make an excellent addition to any collection or toy box. Please check my other listing for lots of Farm toys and replica models. ERTL 1:64th Scale, John Deere 8320R Tractor with Duals Front & Rear. Model 637 Folding Disc! MASSEY FERGUSON. FOUR WHEEL DRIVE TRACTOR. THIS IS A COLLECTIBLE TOY FOR 3 YEAR OLD'S & ABOVE, NOT FOR SMALL CHILDREN. It's new in box. Box has handling/shelf wear. This item is very detailed and very sharp looking. Up for your consideration is a 1949 Ford 8N tractor that I have customized to look like an old, rusty, dirty, and abandoned barn find. This is a 1/64 scale diecast. It has rubber tires and rolls freely. Each custom rusty diecast is unique. No two are ever exactly the same! This would be a great addition to any farm scene or Ertl layout or just a great piece for the classic tractor fan! My diecast models are adult built and are intended for the adult collector. 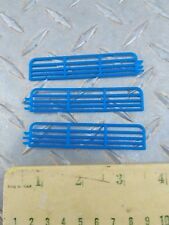 In the last photo have placed this item beside a ruler to give the length in inches. Payment is due within 3 days of the end of the listing. On day 4 an unpaid item case will automatically open. Please check out my other listings for more unique custom diecast models! You are buying a1/64 Ertl John Deere 2510 Nutrient Applicator. The item is very detailed and very sharp looking. 1:64 ERTL 2017 *100 YEARS OF TRACTOR* FORD & NEW HOLLAND *4-PIECE SET* NIB! 2017 FORD NEW HOLLAND 100 YEARS OF TRACTORS! ERTL 1:64th Scale TRACTOR SET! New Holland T8.435. Ford Golden Jubilee. VERY SHARP LOOKING SET! Here is a 1/64 scale Case 4890 tractor made for the 2014 National Farm Toy Show. The tractor is new in the box. Features Dual Rear Tires. Cab w/Glass. 3pt rear Htich & Lots of great detail! 2018 National Farm Toy Show Edition Tractor! 1/64 Ertl John Deere 2730 Combination Ripper - These new Rippers are Awesome! You are buying a1/64 Ertl John Deere 2730 Combination Ripper. This item is very detailed and very sharp looking. You are viewing a diecast tractor in average condition with light wear and marks from use. 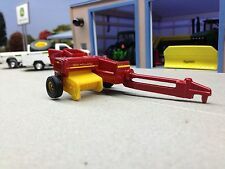 Ertl 1/64 Case IH Magnum 340 #14787 w Free ship! 1:64th Scale, SpecCast Oliver Model 1850 Wide Front Tractor! Beautifully done details! 3pt Hitch, Shift levers & so much more! 1:64th Scale, SpecCast FORD Model 9000 Narrow Front Tractor! Beautifully done details including a 3pt Hitch! ALL THE BEST FROM OUR FAMILY TO YOURS. MIKE, SHERI, AND NICK. FACTORY SEALED. 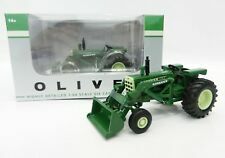 This auction is for a brand New and un opened 1:64 1/64 scale diecast ERTL John Deere 8285R tractor with 2700 John Deere mulch ripper. . nice little set that would make an excellent addition to any collection or toy box. Please check my other listing for lots of Farm toys and replica models. Set includes a modern style John Deere tractor w/ duals. A very nice piece! Including the full standi toys line! 1:64 GreenLight *DOWN ON THE FARM 2* Blue 1984 Ford 5610 Tractor w/Cab NIP! 2019 GreenLight Collectibles. Blue 1984 Ford 5610 Tractor. DOWN ON THE FARM SERIES #2 . RUBBER TIRES. 1/64 Ertl International 4 Piece Tractor Set #441 w Free ship!